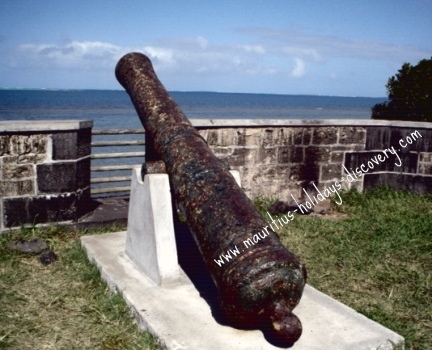 The Naval Battle of Grand Port marked a decisive turn in the colonial history of Mauritius. The island occupied a key position in the Indian Ocean and was much coveted by some rival European nations fighting to establish their supremacy in the region during the colonial period. In 1810 Britain, which had gradually reinforced its military presence in the Mascarenes to protect its interests, launched an attack at Grand Port against the French who settled in Mauritius to take possession of the island. After being colonised and abandoned by the Dutch, the island passed under French dominion in 1715. Notable French governor Mahé de La Bourdonnais, who greatly marked the history of Mauritius by his extensive development of the colony, used Mauritius as a naval base to lead military expeditions to support French troops in India who were fighting the British. Wealthy French traders of the island called “negociants” armed cargo ships for corsair operations. Corsairs in Mauritius (which was named Isle de France by the French) attacked defenseless British merchant vessels and looted their precious cargoes loaded in India for trading in Europe. These attacks severely disrupted British trade in the Indian Ocean as well as disturbing the reinforcement of the growing British Indian Army. On their return route from Britain to India, these ships often carried British soldiers. The corsairs were granted written legal authorisations or “Lettres de marques” by French governor Malartic which demarked them from pirates. Following the outbreak of the Napoleonic Wars in 1803, the security of these routes became a high priority for the British Admiralty. To protect their interests, the British gradually increased their naval superiority in the region. On several occasions the British have blockaded and unsuccessfully attempted to raid Mauritius. 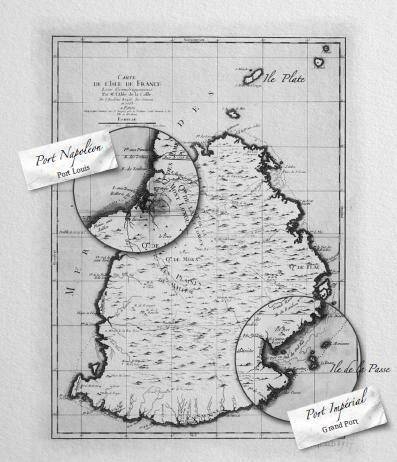 Refining their tactics to invade the island, they set up a plan to capture the fortified Ile de la Passe which was strategically located at the entrance of Port Imperial in the south-eastern part of the country. Once under their control they could launch incursions to the mainland from the offshore islet as well as blockade the port. 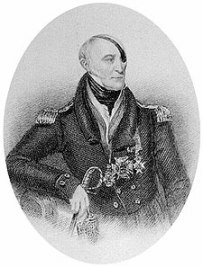 On 28 July 1810, Captain Samuel Pym commanding a British squadron composed of brig HMS Staunch and frigates HMS Sirius, HMS Iphigenia and HMS Nereid left nearby Reunion Island (known as Ile Bonaparte at that time) and set sail towards Mauritius. During one week several incursions were led on the coasts of the country. On 10 August the Staunch, the Sirius and the Nereid navigated towards Grand Port to capture the fortified islet which was guarded by French soldiers. At night a first attempt to land failed due to a rough sea. On 13 August at about midnight the British, under cover of heavy rains and a pitch dark night, landed on Ile de la Passe. Following a bloody fight, French Captain Escussot and his troop surrendered. The British Flag was hoisted and the islet placed under the command of Nesbit Willoughby, Captain of HMS Nereid. Captain Willoughby (photo on the left) launched several attacks at various points of Mauritius. He destroyed a battery located at Pointe du Diable (literally - Devil’s Point) and a look-out at Grand River South East. He also distributed pamphlets to the local residents which urged them to cooperate with the British for their own interests. The Naval Battle of Grand Port in August 1810 would have never left a chapter in the history of Mauritius had the British not wrongly assumed the return of a French squadron to be weeks later. Pointe du Diable - Grand Port, Mauritius. On 20 August the British were surprised when they sighted a fleet of French ships at large of Grand Port. French Captain Duperré, returning with his squadron from a naval expedition in the Mozambique Canal, was unaware of the British’s occupation of Ile de la Passe. 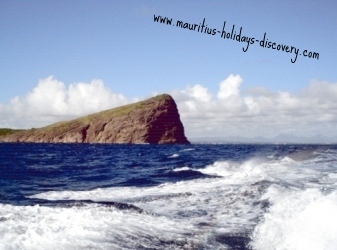 History of Mauritius - The Naval Battle of Grand Port. Victor (in the background) and Ceylon. 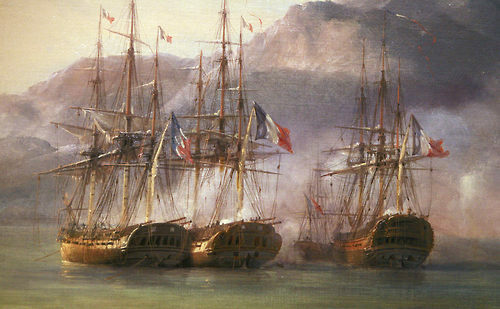 Detail from Combat de Grand Port, by Pierre Julien Gilbert -Musée National de la Marine. Captain Willoughby decided to lure the French fleet into the channel through which ships entered Port Imperial. He hoped to inflict heavy damages and defeat Duperré’s division, thereby quashing their capacity to counterattack the British blockade of Mauritius. Captain Duperré decided to engage his ships – brig Victor, frigates Bellone and Minerve (which were captured from the Portuguese), Windham and Ceylon (both ships belonging to the East Indiamen company and captured in the Mozambique Canal while they were sailing to India under the command of British General Wetherall, who alongside his family and troops were still on board). As Victor passed frigate Nereid and started anchoring manoeuvres, Captain Willoughby opened fire after raising the British flag. Victor’s Lieutenant Morice eventually complied with the British’s summon to surrender. Witnessing the scene from his ship, Bellone, Captain Duperré rallied his troops. Unable to reach Duperré’s ship due to its proximity to coral reefs, Minerve followed by Ceylon navigated through the channel while being under fire from Nereid and the fort. Meanwhile British troops were preparing to take possession of Victor, but Minerve’s captain Bouvet ordered Lieutenant Morice to unmoor his vessel and follow them. The three ships succeeded in berthing securely in the bay. Captain Guy Victor Duperré (photo on the right) decided to force its way through the channel and signaled Windham to follow suit. The later unable to manoeuvre through the channel proceeded to the south where it was later captured by Captain Pym’s HMS Sirius. While Bellone and Nereid were exchanging heavy fires, there was a large explosion near the fort on Ile de la Passe. The French flag used to ambush the fleet fell on a brazier and ignited a fire causing cartridges to explode. There were casualties among the British soldiers and the fort’s cannons were dismounted. Bellone managed to reach Grand Port's bay. During this confusion more than 160 British soldiers were scattered in boats on the sea. As they were sailing to reach the Nereid and the coast of Ile de la Passe, many passed through the French squadron at the risks of being collided with by the French ships. The French, however, did not react. Willoughby’s plan to inflict damages to the fleet was ruined. 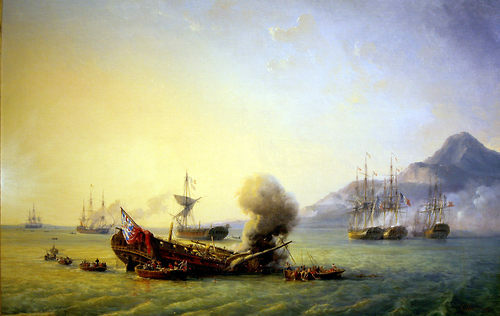 On 21 August the French positioned their ships in the bay of Grand Port. A battle with the British was imminent. Frigates Sirius, Iphigenia and Magicienne joined Nereid the following day and they all sailed towards the French division. The operation came to a halt when Nereid hit a sand bank and was salvaged the following day. At 17h30 on 23 August 1810 a bloody chapter in the history of Mauritius was about to be written. Captain Bouvet of Minerve opened fire on the approaching British fleet. One witness, Thomy Pitot, narrated that the British did not respond but advanced with Nereid leading the fleet. He added that the gloomy silence of the British coupled by their towering sluggish movements towards the bay was frightening and pinched the hearts of all present. While approaching, Sirius and Magicienne hit a coral reef and were immobilised while Iphigenia dropped its anchor to avoid the same fate. It should be noted here that the French have displaced buoys marking the channel through the coral reefs to trap the British. Soon afterward the belligerents opened fire. Officer Wantzloeben who was on board Bellone wrote that the battle was terrifying. Within an instant cannons from both sides roared continuously. Both divisions were enwrapped in a thick smoke cloud and visibility dropped to nil. He added that the darkness of the falling night covering this bloody carnage offered his compatriots, (who anxiously gathered at Mahébourg to witness the battle), both the most horrible as well as the most beautiful scene. At 20 hours the guns were still projecting their missiles with destructive furors, as narrated by Officer Charles Cunat who was on board Minerve. He added that the guns were thrusting fireballs like volcanoes and flashes of the terrifying blasts revealed gory scenes. He continued by saying that the French were gradually gaining in superiority over the British who, over all these bloodshed, were engaged into a frenzy fight not for victory but to revenge their inevitable defeat. The British stopped fire at 23 hours. Nereid was shattered and Sirius and Magicienne were still grounded. At daybreak on 24 August 1810, the scene was horrible. Dead bodies and debris were floating on the sea which had turned red by blood. Victory for the French was almost at hand, but the British did not surrender. They renewed battle which lasted till 1 o’clock in the morning of 26 August. 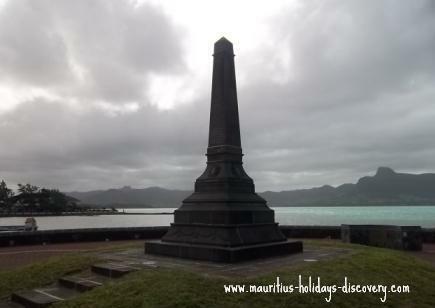 A desolate scene in the history of Mauritius - The Battle of Grand Port. Musée National de la Marine. over several days, are depicted in this painting. HMS Magicienne - abandoned by its crew after being set on fire. The frigate exploded soon after (on 25 August 1810). HMS Sirius - abandoned and set on fire by its crew. HMS Nereid which surrendered to the French. On 28 August the British accepted the French’s proposals to surrender after they suffered heavy casualties and their fleet lost. Captains Duperré and Willoughby were severely injured in the fight. 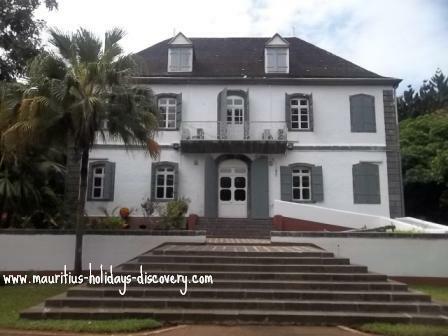 They were both given medical treatments in a house, which is now the National History Museum of Mauritius, at Mahébourg. In France the victory was pompously celebrated with a commemorating inscription made on the Arc de Triomphe in Paris. The defeat at Grand Port, however, did not deter the British’s determination to conquer the island. With renewed resolve they gathered an armada of 60 ships with over 10,000 British and Indian troops. 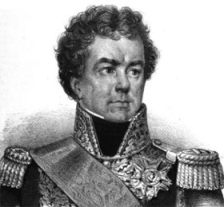 Led by General Sir John Abercrombie they landed at Bain Boeuf on 29 November 1810 to launch a full scale invasion. The meagre French Army of barely 2000 men could not resist such a massive attack and French General Decaen opted for a capitulation on 3 December 1810. Henceforth the history of Mauritius was written under British colours, till the Flag of Mauritius was hoisted for the first time on March 12,1968. CHELIN, Jean Marie, "Bicentenaire de la Prise de l'Ile de la Passe et du Combat Naval du Port Impérial Isle de France 1810-2010", Mauritius. SELVON, Sydney, "A Comprehensive History of Mauritius", Mauritius, 2001.